This year, Landform Surveys have been asked to survey many large scale highways projects, such as the M1 in Leeds, & the A19 in Durham. All these surveys have required road closures to ensure the safety of site personnel, inconvenient for motorists but essential for safe operations on site. This summer we were involved in another large scheme, a large-scale topographical survey of the A18 in North Lincolnshire. 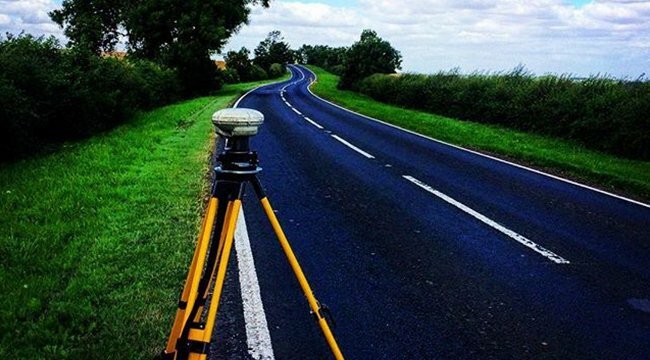 We were commissioned to do this road surface topographical survey by Aecom. This stretch of road had a number of fatal accidents, and our survey was part of a full investigation into the causes and how we could reduce accidents in the future. We examined man-made features such as the road markings, the location of anti-skid surfacing and positioning of signage alongside the geographical features. It was a long, straight stretch of road with narrow verges and had limited sight lines. The area we surveyed was 13km in length, which was no easy undertaking. There were many safety considerations for both our surveying team and the general public to consider. In the end, we knew we wouldn’t be able to do the survey to the required standard with live traffic, so there was a full road closure from 8-12th of August. We worked closely with ENGIE to manage this road closure as smoothly as possible. Before undertaking any work, we had a pre-start meeting to discuss traffic management phasing and action to ensure everyone on both teams was on the same page. This communication between the surveyors and the traffic management teams is crucial to making sure the survey is undertaken in a safe environment. As there was a lot of ground to cover and we wouldn’t be able to go back to the site and take any further measurements once the road was re-opened, careful planning was done before the survey. We worked out that 2.6km of highways had to surveyed every day; no easy feat! Using six survey teams, we were able to complete the work ahead of schedule. Due to the scale and constraints of this survey, we had to use careful communication on site to minimise overlap and maximise our time on site. Some of the trickier issues was tying in surveys between the survey teams and ensuring everyone stayed safe on site as some local traffic was still allowed through. Our surveyors did a good job of having open communication before, during and after the survey and for looking out for each other’s safety while conducting the survey. We are pleased to say that this survey was a success. The survey was completed on time, with over 18,000 measurements taken with excellent accuracy of data over the course of the 13km linear survey. We are proud that our work will contribute to making this stretch of road a safer place for drivers and passengers alike.